Scott Waste offers the best dumpster service in the entire valley of the Sun. Why? Because we do more than just dumpster rental in Phoenix. We give personalized service! We serve Phoenix, Mesa, Tempe, Scottsdale, Chandler and surrounding Arizona cities with top-notch dumpster service. We have 4 dumpster sizes available to rent - 12, 15, 20 and 30 yard roll off containers. Whether you need a single 12 yard dumpster for a small garage cleanout or our 30 yard dumpster for your home renovation project, our team will help you determine the correct size dumpster for your dumpster rental in Phoenix. or any other cleanup project you may have. Learn more about our residential dumpsters for rent. Our roll-off containers will help contractors maintain a safe, clean and organized job site. We can help streamline any debris removal project with reliable service and competitive contractor rates for dumpster rental in Phoenix and surrounding areas. We offer small to large sized dumpsters for jobs that have limited space constraints as well as our larger 20, 30 and 40 yard commercial sized dumpsters for larger construction type projects. Call us at (602) 438-2243. Learn more about our dumpsters for contractors. 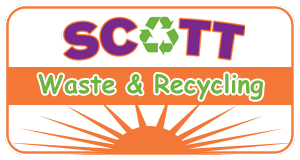 Scott Waste is the hassle-free solution for all of your waste and recycling needs. Our dumpster service area includes, but is not limited to the following cities. If your city is not listed please call our customer service to see if we service your area. * Delivery Fee may apply out side of 25 mile radius. At Scott Waste you can expect professionalism and clear communication. What information do I need to have to place a dumpster rental order? Prior to placing your order, you should have an idea of how long you will need the dumpster, the type of waste you will be placing in it, the location (including any placement instructions), and whether you require any permits from your local municipality. We usually deliver on a next-business-day basis, but we will accommodate same-day deliveries whenever possible. How and when do you take payment? Acceptable payment methods are cash, check, Visa or Mastercard. No matter when charged, credit or debit cards will not be processed until the delivery date. Checks and cash must be provided at time of delivery. Contracts with approved credit apps may be invoiced. Are there really no hidden charges? There are absolutely NO hidden charges. However, please note that overweight dumpsters, extended rental times, extra trip fees, hazardous materials in the roll-offs, or damage to the container may result in additional cost. Your Scott representative will explain these in detail before or at delivery. How much notice do I need to give to change or cancel my order? As a general rule, please allow a minimum of 24 hours notice for changes or cancellations. Typical residential placements are for 7 days, but shorter or longer periods of time can be arranged. Licensed contractors may qualify for extended set times. Scott calls every customer a day or two ahead of a scheduled pickup to confirm that the dumpster will be ready on time. This depends on your local municipality. You can call us at 602-438-2243 for assistance in figuring out this information. Where will my dumpster be placed? Roll-offs can be placed wherever the customer requests, provided it does not create a safety hazard. Street placement must comply with local regulations and may require a permit (additional costs may apply). Lawn placements will require a waiver. Dumpsters are designed so they don’t cause damage to a typical asphalt or concrete driveway, however, we recommend placing plywood beneath the dumpster to help avoid any potential risk. Scott Waste Services will not assume any liability for damages incurred by placement of the dumpster on your driveway. For additional information, please contact us. Can I move the container? No. The roll-offs are designed to be moved only by specially equipped vehicles. If you attempt to move them on your own, property and/or dumpster damage may result. How much waste can be placed in the dumpster? You can typically fill your dumpster water level with household debris as long it is within the tonnage limits. In order to transport the container, nothing can protrude outside of the top of the dumpster. If the roll-off is overloaded, you are responsible for off loading. Will I be billed for extra tonnage? There is a weight tonnage allowance for each specific dumpster size. Any tonnage over the limit will incur an additional fee. Please discuss the tonnage allowance and extra fees with a Scott customer service representative. Do you accept hazardous/medical waste? No. You cannot place any hazardous materials or medical waste within the dumpsters. For disposal of hazardous waste, please check with your local municipality for specific guidelines and regulations. 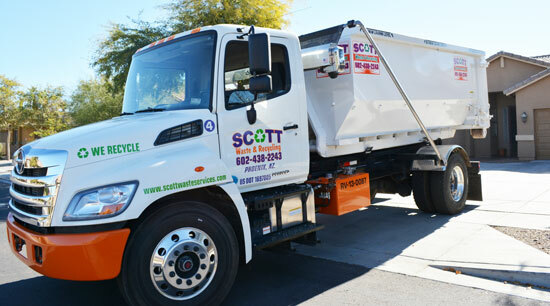 Scott Waste Services offers the BEST Phoenix roll-off dumpster rental in the valley of the Sun. Why? Because we are more than roll-offs, we are personalized service! Family owned and operated for over a decade, Scott Waste Services is Phoenix’s premier roll-off container provider. You can expect prompt, affordable dumpster service and excellent customer service. We do what it takes to meet the diverse needs of our clients, just take a look at our reviews! – You’re not just a number at Scott Waste! When you contact us you are getting superior knowledge and expertise, most of the time from Scott himself. We will help you figure out what size roll-off you need for your project. From scheduling your dumpster to dumpster placement, we are here to serve you and all of your disposal needs. Call us at (602) 438-2243 with any questions, visit our FAQ or request a quote today.